Threaded rebar is used as an alternative anchoring method when securing sign structures, wind towers, structural steel, and other foundation applications. These rods are most commonly made from ASTM A615 Grade 75 rebar with a minimum yield strength of 75 ksi. It is also referred to as jumbo rebar and available in two diameters – #18J (2-1/4″) and #14J (1-3/4″). To ensure proper thread fit the rebar must turned down to remove the deformations. This uniform surface is used to create the required threads. 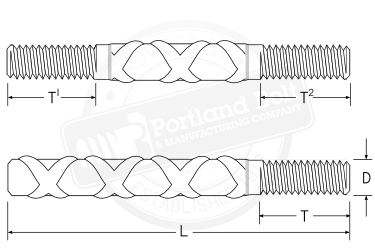 Plain finish and hot-dip galvanized threaded rebar anchor bolts are available.